Rick's Pocono Blog: Shopping, Fishing, and Lakefronts in the Poconos! Shopping, Fishing, and Lakefronts in the Poconos! While Shopping in the Poconos this Season, you can find yourself spending the day at one of the many shopping outlets in the Pocono Mountains! The Crossings Outlet Stores in Tannersville Pa provide a variety of shopping including Namebrand Clothing Outlets, Restaurants, Family Stores, Candy Stores, and much more! Also, only a few minutes up the road is Camelback Mountain & Waterpark. Spend a Day at Camelbeach and a mile or two away find yourself at The Crossings spending the night going threw your favorite shopping stores and dining out with the Family! The Sun is Shining and the Fish are biting! Fishing is one of the biggest Recreational Activities in the Pocono Mountains with the many Bodies of Water that run through the Mountain. Some Pocono Communities have their own Boat Launches and offer Sailing, Water Skiing, Canoeing, and much more. Get yourself a Beautiful Lakefront Home on one of the many Lakes of the Pocono Mountains. The feeling of walking right out your back door and seeing a Crystal Clear Pocono Lake is an overwhelming feeling of Joy and Excitement. The fish are biting, and The docks are ready! Find Yourself a Perfect Pocono Mountain Lakefront Homes that best suits you on the Ricks Mountain Homes MLS Dream Home Finder Page. It' a FREE Search! Tee Off in the Poconos This Spring! Summer Is Right Around The Corner in the Poconos! Come Golf at a Pocono Resort This Spring! Big Bass Lake Blooms With Spring Coming! The Fish Are Biting in the Poconos! The Many Lakes of the Poconos! Big Bass Lake Embraces The Fresh Spring Season! Welcome to the Pocono Mountains of Pennsylvania! Skytop Lodge Resort Welcomes Outdoor Enthusiasts! 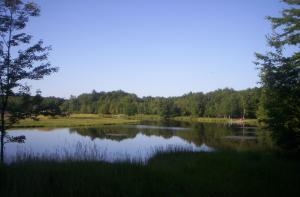 Buy Or Rent a Home Right on the Pocono Gamelands!